Roomy, 3BR/2BA, Condo ~On~ the Beach! 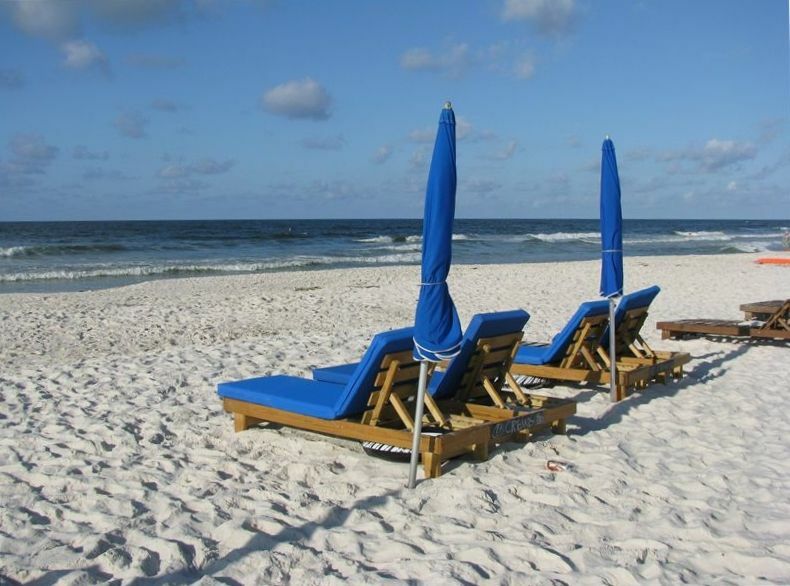 Come enjoy our favorite vacation spot on the beautiful sugar beaches of Gulf Shores, Alabama! Our condo is a very roomy 1250 sq ft gulf side view unit. The master bedroom has a king size bed, full size crib, private bath, and flat screen TV with DVD player. The second bedroom also has a king size bed and flatscreen TV with DVD player while the third bedroom has a single over double bunkbed and a flat screen TV with built in DVD player. The second and third bedrooms share a bath. The living area is very roomy! The kitchen is open to the living room and dining area-separated only by a very large bar with 6 barstools. The dining area seats 6 as well! The living room has an L shaped sofa and a flatscreen TV with built in DVD. The balcony seats 6 comfortably and is the perfect place to spend time relaxing when not on the beach! Our unit is within walking distance of shopping, dining, entertainment, and the newly renovated 'Hangout'- a hot spot in Gulf Shores. Also available close by are 'Waterville' and 'The Track' amusement parks, the Gulf Shores Zoo, Tanger Outlet Mall, and lots of golf courses! Don't miss eating at 'Lu Lu's', a local favorite owned and run by Jimmy Buffett's sister. We're only 15 min from concerts at The Wharf. There is so much to see and do in the area, and Pensacola NAS (home of the Blue Angels) is only a 45 min ride away- watch their practice flights and tour the museum for free! We strive to be family friendly. In addition to the full size crib you will find beach toys, videos, puzzles, and games. And to help you enjoy your time, there are books, an exercise room, and paths and sidewalks throughout Gulf Shores. The pool area is beachfront and has both a pool and a kiddie pool. There are 2 covered areas with picnic tables near the pools for times you wish to enjoy the sounds and sights of the beach without exposure to the sun. Charcoal grills are also available in this area. We are located very close to where Hwy 59 reaches the beach. Our unit is a favorite for the 4th of July, Hangout Music Fest, and Shrimp Fest! Check the calendar below for availability- we update it regularly. Our condo is on the beach, with a balcony that has a side view. Parking passes are purchased from security. Limit of 2 vehicles. The washer did not work during our stay. I contacted the owner and she ordered a new unit but said it wouldn't be delivered during our stay. So this left us with wet and sandy clothes to take back. Also the master bedroom has a terrible musty or moldy odor that lysol couldn't even cut. Wish we would have had a better stay. Unfortunately, the new washer did have to be ordered and was not available during your stay. I do apologize for the inconvenience, but it was out of my control. The dryer was working fine, so any wet items could have been dried. I can only assume the musty smell mentioned was from wet items belonging to the renter. A new matching front load washer and dryer have since been installed. The unit is very spacious, building is right on the beach. We enjoyed the location and the pool. We struggled with the washing machine but we let the owner know and she was going to have it checked out! Kitchen is stocked, lots of dishes, pots, pans, etc. The unit could use updating but it suited our needs for the week and we had a great time! Our family of 8 had a great stay at this Island Winds West condo. We took advantage of the rental chairs and enjoyed the pool. Loved the location and the beach. Close to everything our family enjoys. The price was reasonable and the owner is very helpful. I wouldn’t hesitate to stay here again and will gladly recommend it to our friends. Thanks for a great vacation stay! Thank you so much! We are grateful you enjoy our condo as much as we do, and for the same reasons. Please keep us in mind for future rentals! the condo was great, unfortunately they were painting and didn't have use of the porch. Owner didn't know until the day we were to arrive, and made restitution, but we really missed not being able to use it. Well stocked kitchen. Rates are subject to change until final confirmation of booking.